This gorgeous silver-plated jewelry set sparkles and shines with its bell-shaped design of clear rhinestones and white faux pearls. You are certain to feel like the "Belle of the Ball" while wearing this lovely set! Size: The necklace is adjustable from 16" to 18" long and the matching earrings measure 1-1/4" long. 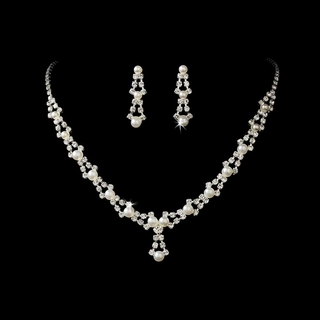 Please Note: This listing is for a silver-plated rhinestone set with white pearls; however, we do offer this jewelry set without pearls as well.